Boat Description Our most compact V-16 single console model, the Tracker Targa 16 SC is feature packed. 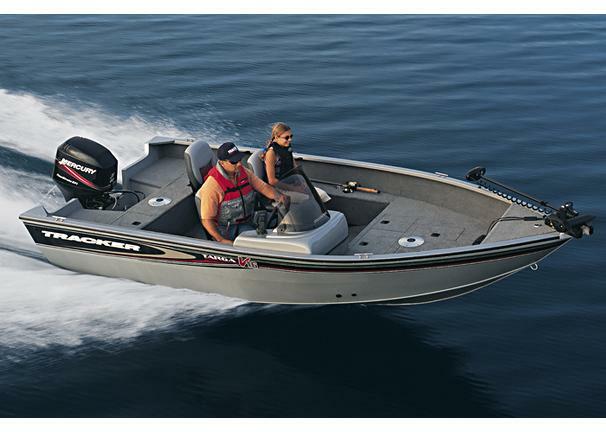 It has the Deep V confidence to go fishing anywhere and is a snap to trailer, launch and store. The heavy-duty marine-grade aluminum hull is deep and wide to provide extra stability and storage in a compact, 16-foot package. The single console layout provides plenty of flexibilitywith pedestal fishing seats that move from floor level to casting decks and back. Package includes Mercury Pro Series outboard, Lowrance X47 fish finder, Minn Kota foot-controlled trolling motor, 23-gallon bow livewell with baitwell insert, 9-gallon aft livewell plus custom trailer with EZ lube hubs, GalvaShield protection and swing-away tongue. Dry Weight 1295 lb approx. Engine Notes Additional Mercury engine options available. Two and four-stroke engines available.